Japanese Studio Profile: SUNRISE Inc.
Japan-based SUNRISE Inc. certainly knows how to keep an audience entertained with award-winning movies and animated shots that couple the art of traditional anime with 21st century CG technology. In this Q&A, learn how Animation Director Shuhei Morita and Manager Kiyohiko Takayama of SUNRISE have integrated LightWave into the studio’s production pipeline to help meet the studio’s tight deadline and deliver anime that really entertains. Hiroyoshi Abe of Tokyo-based LightWave reseller D-Storm visited with Morita and Takayama to learn more about their backgrounds, creative inspiration and use of LightWave in the anime pipeline. In 1998, Shuhei Morita joined the production company KamikazeDouga as a 3D CG creator—it wasn’t long before he realized a desire to create and produce his own stories. 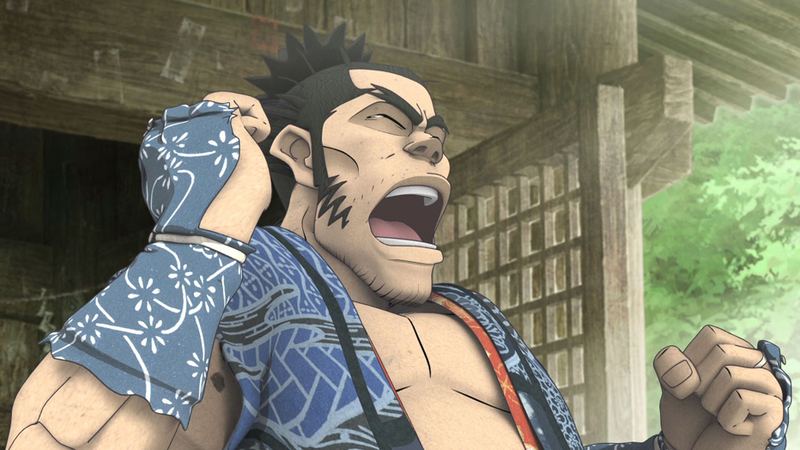 Following his passion, Morita established the production group Yamatoworks in 2003 and teamed up with friends to create the studio’s first movie Kakurenbo. Released in 2005, Kakurenbo won several awards such as the Excellent Work Award at the 2005 Tokyo International Anime Fair, Gold Prize at the Fantasy Film Festival of Canada, and the Recommendation Prize by the Examination Committee for the Cultural Affairs Media Art Festival. In 2006, Morita joined Sunrise to create the Freedom Project, which won the Excellent Work Award at the 2007 Tokyo International Anime Fair. Director of the movies Freedom and Coicent, and Tsukumo, Morita was also involved with Short Peace, four anime short projects from SUNRISE that were nominated for the 2012 Annecy International Animation Film Festival. Kiyohiko Takayama joined the SUNRISE management staff when the company started creating the movie Steamboy. He is currently directing Coicent and Tsukumo. What inspired you to start using LightWave for CG production? Morita: The Final Fantasy game, which came out while I was in college, really inspired me to learn more about 3D CG. Then after watching Blade Runner, Akira, and the anime series directed by Mr. Hayao Miyazaki, I became interested in video production—so I went to art college to learn more. I also worked at a printing company while in college and learned Photoshop and Illustrator—later I was able to apply what I learned in those applications to CG production at KamikazeDouga as a part-time artist. While there, I purchased LightWave 5.5 and started experimenting with 3D CG for the first time—creating some of my own works like Reki and OtokoDate. Fortunately, some of my creations were winners of an MTV Station-ID competition and ioCI won a 1999 Wavy Award as well. Which titles or projects produced at SUNRISE were created with LightWave? Takayama: We created Freedom, Coicent, and Votoms Finder Armored Trooperoid with LightWave and currently we are making the short movies Tsukumo, Gambo, and an animated short that has not been announced yet but will be revealed in 2013. 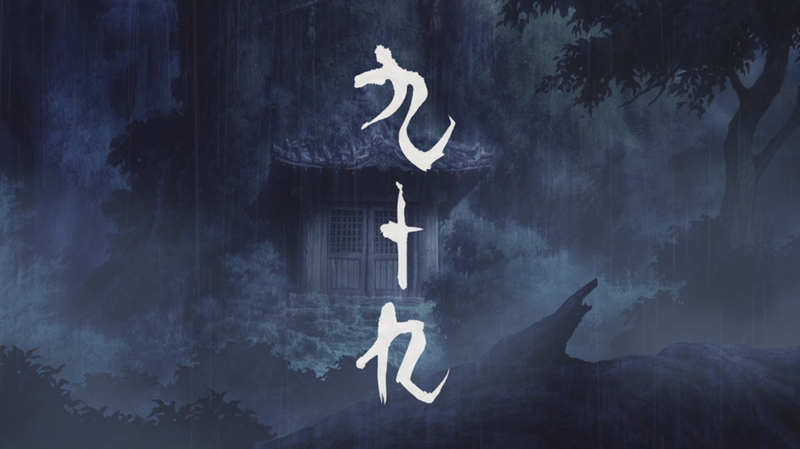 Can you tell us more about "Tsukumo" the movie? Morita: Tsukumo, is a new animated 13-minute short from Kakurenbo creator and Freedom director Shuhei Morita; it was created as part of Katsuhiro Otomo and SUNRISE's anthology Short Peace. Short Peace assembles the leading-edge creators of Japanese animation to explore future avenues of expression. There are four shorts in the anthology, including Hi-No-Youjin and Tsukumo. Short Peace is also the title of a collection of Otomo's manga shorts that were first published in the 1970s. Yasumasa Tsuchiya is producing the shorts at SUNRISE. Tell us about the style of “Tsukumo.” Is it a departure from your traditional artistic style? Morita: I normally create 2D anime, but I wanted to present more realistic 3D dolls and creatures in a 2D anime style for Tsukumo. Tsukumo is basically styled in traditional Japanese anime, however, our challenge was to present things that do not appear 3D, but give the appearance that they are made of materials. We wanted the materials to appear as if they have “sound” by the way they are textured. Some examples would be objects dropping or hitting each other, the rustling of clothes and so on. To achieve that particular look and style, I purchased many traditional Japanese papers and scanned them to create lots of textures that could be used on things such as kimonos, Japanese cloth, wood materials, skin and more. Can you tell us about your creative workflow for "Tsukumo?" Morita: We used pencils, Photoshop, and LightWave for all of the 3D CG. Compositing was done completely in After Effects. We divided some scenes into parts and four 3D CG artists, including myself, were tasked to create those parts of the scenes—from modeling and texturing to rendering. I was in charge of the scenario, production, and direction; Keisuke Kishi was in charge of the original plan and plot design; Daisuke Sajiki was in charge of character design; Takasuke Sakamoto was responsible for CG production; and Koudai Satou was in charge of animation. Additionally, Gouki Nakamura was art supervisor and Hiroyuki Horiuchi was responsible for 2D drawing. How long did it take to create the 13-minute movie? Takayama: It took about six months to create the entire movie—Morita made the scenario in January 2012. How many cuts or shots did you create? Morita: We created103 shots; each shot was a little longer than normal shots. What is the role of LightWave in the production pipeline of "Tsukumo?" Morita: This movie was all created in LightWave—from modeling and animation through rendering. What was your biggest challenge during production? Morita: My struggle was to create continuity between scenes. A limited budget and tight deadline often had us up all night long—everyone on the team had red eyes for several weeks pushing to meet our production goals. However, our big passion for creating this movie kept us committed to the short—especially, Mr. Sakamoto, the first CGI supervisor on the project. Takayama: Our team was small but everyone worked together to help each other out when it was needed. We all brought ideas for the creation of the movie during the production phase and everyone worked together to reach the end goal. Can you tell us why you Mr. Morita and SUNRISE are using LightWave in your production pipeline? Morita: As long as we can create characters in Modeler and move them to Layout for our anime, we have no need for the more advanced features and functions LightWave offers—I tend to use basic features for most of the work I do in LightWave. Of course, I realize that if I used more of the features and functions LightWave offers, I could get many different results, but I prefer to keep it simple. With LightWave, I can modify model data and animation scenes very quickly whenever I want; it’s much like 2D drawing on paper. The reason why I use basic LightWave features for most of my creations? it is easy to see the strengths and skills of artists when they use basic LightWave features. We could easily create animation by taking advantage of plug-ins or new cool feature sets, but I want our staff to keep sight of the artist versus the tool. By using the basic functions in LightWave, I can quickly figure out an artist’s skill level and individual style. Another benefit is that new staff artists can quickly start using LightWave—it becomes their electronic pencil—and there is no need for extensive training. Artists should always have the end goal in mind from the beginning—it’s not so much how you reach the goal, but that you have a clear goal in mind as you move through the process. LightWave helps us reach our goals quickly and easily. Takayama: In the mid-90’s when the Japanese Anime Industry started converting their production process from traditional hand drawing to digital with CG tools, there were many experienced LightWave artists in the industry with knowledge of the traditional anime process and anime created with 3D CG tools. It worked to our advantage. What is your favorite feature in LightWave and how do you use it specifically? Morita: Morphing!! I use Morphing a lot—it’s easy to create animation by simply deforming an object. I use the traditional morphing function in LightWave to create motions—not the latest morphing tools in the latest versions of LightWave. For example, I can create three different poses—Pose1, Pose2 and Pose3—and morph them to make the character walk without having do set up 3D rigging. This way is very simple and easy for me to get the look I’m after. The process of traditional 2D anime is basically creating keys on some main original still images and then put some another still images between the keys to present smooth motions. I can do a very similar process with LightWave’s morph tool. Are you still using the morph technique for your current work? Morita: Yes, I still use this technique a lot. Many colleagues (new young guys) who don't know this technique sometimes ask me: "What technique is that? I've never seen such a technique!" When they try morphing they discover that it is a nice process for creating motion. How about the scene in "Tsukumo," where the edge of the kimono is swinging? Did you use morphing in LightWave to create that effect? 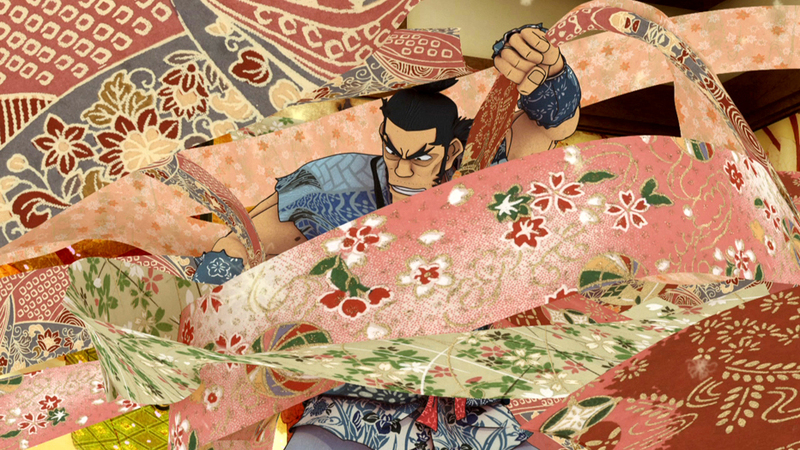 Morita: I did use the morphing feature to create the swinging edge of the Kimono but, sometimes I may use a different software to achieve different results. What is the next project after "Tsukumo?" Morita: I am planning to create about 10 minutes of serious history animation—it is not for TV or film. Right now I can’t share any more details about the project. Takyama: SUNRISE is now shifting to the creation of TV series instead of movies after the Short Peace project is done. What advice do you have for creators who just starting to use LightWave or people who want to work in the anime industry? Morita: Try to find your own “pencil” that you can control freely. One that will allow you to create own your work the way you want it. The pencil could literally be a pencil, a 3D CG tool, Photoshop, or something else. There are many tools to choose from in this world. But to work in the Anime Industry, your main job is to have the skills of an artist—you must be able to draw with 3D CG tools, Photoshop, pencils, or whatever. The sooner you find your own “pencil” the sooner you will be able to freely draw the images that you have in mind. In my case, LightWave is my pencil! Takayama: Approach everything with a positive attitude—don’t let “I cannot” enter your mind. There is no perfect computer graphics tool. You might feel that you cannot be creative on a project that you don’t like or believe in—especially if your boss or client is making it difficult to envision or realize. However, before you completely reject a project, think about how you can bring it as close for your client's vision as possible using your favorite “pencil.” Because you can do anything if you set your mind to it.